للمسافرين الذين يرغبون أن يعيشوا كل ما تقدمه المدينة، منتجع بالم رويال كيرنز هو الخيار الأمثل. يمكن من هنا للضيوف الاستمتاع بسهولة الوصول إلى كل ما تقدمه هذه المدينة النابضة بالحياة. يقع هذا الفندق الحديث على مسافة قريبة من المعالم السياحية الشهيرة. إن الخدمات الممتازة وحسن الضيافة العالي في منتجع بالم رويال كيرنز تجعل إقامتك تجربة لا تنسى. هذه بعض الخدمات الموجودة في هذا الفندق: واي فاي مجاني في جميع الغرف, خدمة التنظيف يوميًا, خدمة غسيل ذاتية, خدمة سيارات الأجرة, مكتب استقبال 24 ساعة. في منتجع بالم رويال كيرنز غرف نوم يزيد عددها عن 150 صممت بذوق وعناية لتوفر لك كل وسائل الراحة . بعضها يحتوي أيضاً على شاي مجاني, خزانة, مناشف, قهوة فورية مجانية, مرآة. يقدم الفندق مجموعة رائعة من الخدمات كمثل مسبح خارجي, سبا, مسبح للأطفال, حديقة، لجعل إقامتك تجربة لا تنسى. استمتع بخدمات لا يعلى عليها وعنوان ذو اعتبار في منتجع بالم رويال كيرنز . Room was spacious, with three beds (two double ones for our kids) which made our stay comfortable. The hotel staff helped arrange tours and transport to other places. They provided us extra towels and toiletries on request. 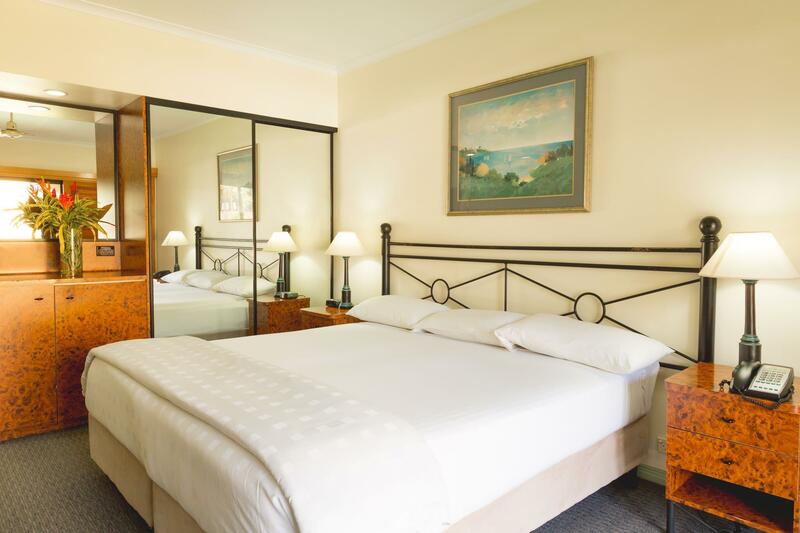 The hotel is located in a quiet place, about 10-15 minutes drive from downtown and airport, and a shopping center nearby. The kids were excited to see cockatoos - there were a whole bunch of them - perched on tree branches across the street from the hotel. We will definitely stay there again. They clean the room everyday, the room was spacious and with balcony so it's very convenient especially for smokers. 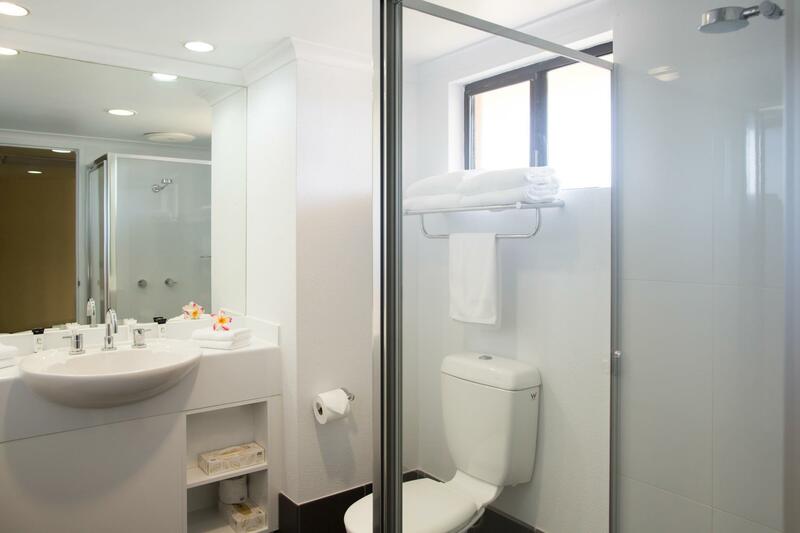 Toilet and bath is clean and newly renovated. The location is far from the city, uber costs around 12-16 per trip, or will take 45min to 1hr walk. Dear Alex, We are delighted you enjoyed your stay with us here at Palm Royale Cairns. We look forward to welcoming you back again in the near future and hope you will experience our Beaches Café which has been recently reopened for afternoon casual snacks & drinks. Amazing Hotel with all facilities. But a bit far from the Esplanade, so theres little to do at night. However, the staff, rooms and ambiance is amazing. Also, u will get guidance and help from the staff for the day tours. Go for Big-Cat Tours. Overall, superb experience. Pool-view Rooms were good for stay. Though, I stayed there for a night. I did go to the Swimming Pool and the Jacuzzi for a dip and relaxation fr 2 hours. There was a shopping center next to the Hotel. Hence, catering needs could be satisfied. In addition, the restaurant inside this Hotel offered good breakfast. Parking facilities were provided but it was located in the Annex instead of the Main Building. Dear Gryphon, Thank you for taking the time to review our property. We are delighted to hear you enjoyed your stay with us. We would certainly love to have you return in the future. Once again thank you for the great feedback. We hope to see you again soon. Stayed overnight the beds were comfortable and the rooms were quite -minimal road noise. Front office staff were helpful & friendly. Good price for location & overnight stay. I was a bit surprised that the rooms didn't have a microwave or any cold water in the fridge. Also the air con had 3 levels - cold, colder & coldest. Would have been nice to be able to set around 24-25c. There was minimal on site parking had to park in the quite cul-de-sac street. Three night stay which we really enjoyed. roof pool wonderful bottle shop near and supermarket ten min drive. Enjoyed noodle café down the road and able to take own drink with no surcharge. Local pub disappointing but position and staff great. This was an unexpected delight in my recent business trip to Cairns. The room was a great size and I was thankful for the upgraded room, only wish I'd been able to stay longer. The pool area looked great but it was raining while I was there so I didn't get to enjoy it. You get an hour free wifi but if you want longer you need to go down to reception which is a bit inconvenient, especially as I was trying to work in the evening. The bathroom was big and very clean and the room was lovely. I'd definately stay here again. My only issue was that at breakfast every table was taken and nowhere for me to sit, so I went without. There was a large tourist group in at the same time and it was impossible to get near the breakfast area but other than that it was a great stay. I paid $66 AUD for the night and that is amazing for Cairns. It is a bit out of town so you would want a car or use their shuttle bus at $5AUD each. Shopping centre and pub close by. Very helpful staff. Excellent pool. About 5 to 8 minute drive from the city (where most food and entertainment is). At $66 AUD I will be staying there always now. The road is a little busy but we found the room well enough insulated that it wasn't a problem. For the money it is super! Very helpful, friendly professional staff, - all staff. Modern, comfortable room, (older-style TV, but ok). Attractive, well-maintained grounds, two large pools. Free wifi available, vouchers from front desk. Shuttle bus available into city, $4 each way. Any pool activities/noise restricted to before 10pm. We would definately choose to stay again. Had Pool View room on side-street side. All staff friendly, helpful and polite. A/C keeps room comfortable. Friendly Helpful Staff. We enjoyed our stay at Palm Royale. Very clean and the service from all staff was fantastic. A bit of out city centre. Uber from airport to there was $25, taxi from city centre to there is $17 on average. A free shuttle to Colonial Cairns (not an enjoyable restaurant in my opinion). Good timely shuttle to reef terminal and DFO and nightly markets and back for $5 each way. Great value for money. Breakfast was good- usual hot breakfast offerings- not much service involved there but hey, for the price you pay, pretty decent. Would stay there again if required no problem! Dear Marie, We are delighted you enjoyed your stay with us here at Palm Royale Cairns. We look forward to welcoming you back again in the near future and hope you will experience our Beaches Café which has been recently reopened for afternoon casual snacks & drinks. escaping from the cold weather in Sydney, I went to the north, Cairns. 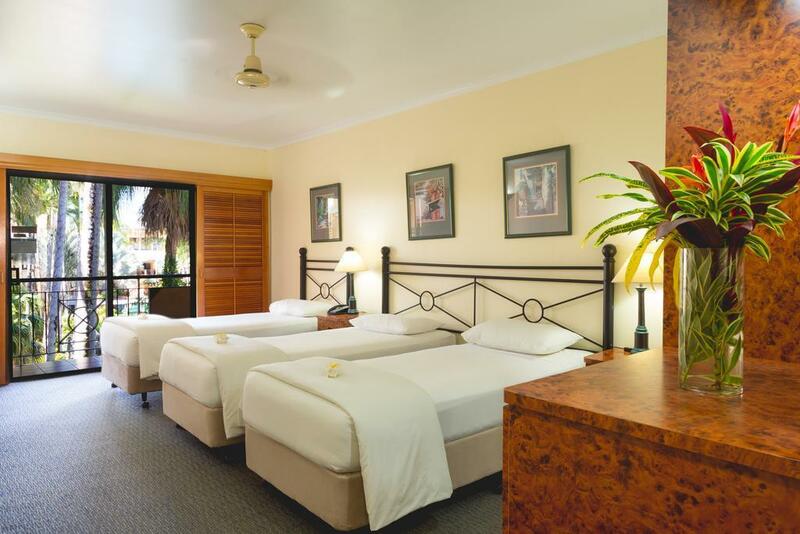 Palm Royale provides a nice and pleasant stay if you are travelling on budget. Nice staff and pools. Located right next to a small shopping mall for daily essentials, and the bus stop to the city is there, too. Very easy to get around. Dear Nim, We are delighted you enjoyed your stay with us. 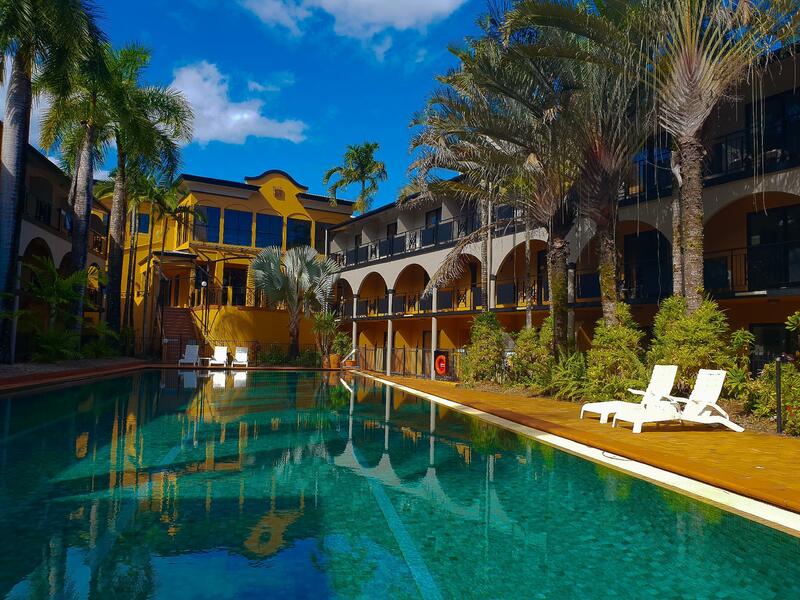 We look forward to welcoming you back again in the near future and hope you will have a bit more time to enjoy the facilities and service of Palm Royale Cairns. Welcoming, efficient staff. 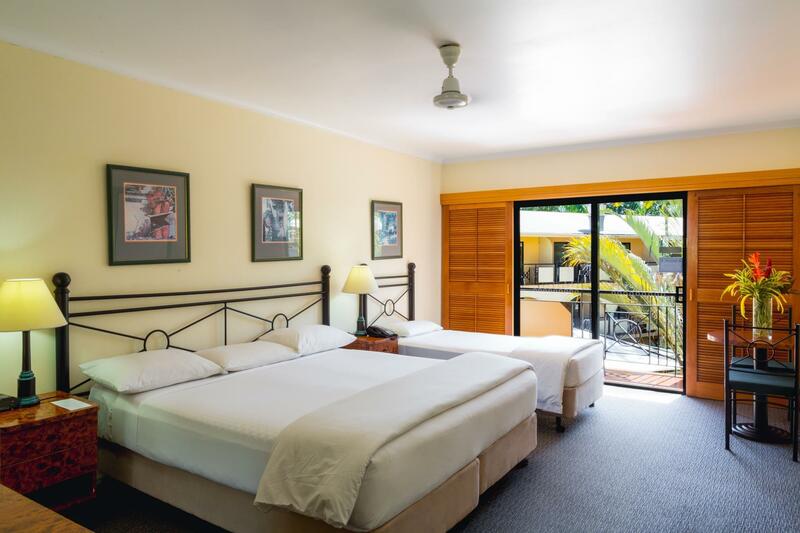 Clean and comfortable room with lovely view over central lap pool. Full breakfast available at additional cost. Evening and drinks beside the main pool with prawns and antipasti (very reasonably priced). Seven mins by car to CBD. Raintrees shopping centre 2 mins walk for self catering. Very relaxing holiday. Dear Diana, I am thrilled to hear you enjoyed your stay with us and that you took full advantage of the facilities our hotel has to offer. On behalf of the whole team here we thank you for your review and look forward to welcoming you back again soon. A lovely hotel with friendly honest staff. Extremely clean and with good facilities. There was some issues with wifi not connecting. Outside the hotel at night there is a fantastic sight of hundreds of beautiful white cockatoos (birds) sleeping in the trees, which is well worth seeing and photographing as it is unique. Dear Rebecca, Thank you for taking the time to review our property. We are delighted to hear you enjoyed your short stay with us. We would certainly love to have you return for a longer stay in the future. Once again thank you for the great feedback. We hope to see you again soon. Dear Lisa Thank you so much for your kind review. We are lucky enough to be not so far of the action of Cairns Esplanade but still 'tucked away' enough to make it feel like the hidden gem that it is. We look forward to welcoming you back in the near future. The staff were very helpful & friendly. The pools fantastic Rooms clean & serviced everyday The shopping centre near by was very handy & the bus ride into the cbd was great when required & took 5minutes. Dear Kenny, We are delighted you enjoyed your stay with us. We look forward to welcoming you back again in the near future and hope you will have a bit more time to enjoy the facilities and service of our Resort. We knew it was a slightly older hotel, but the Bathroom was clean (redone) and but overall I must say the room (cleaning) service, and assistance was good. No Water provided, and you pay a small fee ( AUD 5) for their shuttle bus to night market and AUD 20 for a 3 day unlimited pass ( useful) ! BF was good and standard , but nothing extensive or great . Dear Dheeraj, Thank you so much for your review. We are lucky enough to be not so far of the action of Cairns Esplanade but still 'tucked away' enough to make it feel like the hidden gem that it is. We look forward to welcoming you back in the near future.